Hello! Hope you've all had a great christmas and thoroughly stuffed your face with all things yummy - I know I did :) Had a lovely time with all the family (and for those wondering - the boys loved the poo presents and I think were impressed by the paper loos too :D - I did take photos as I made those so may just do a tutorial one of these days if ever I run out of things to show - they would be great to put other small joke presents in too). Right, well, whatever your plans are for seeing out 2009 and welcoming in a new decade (blimey, time really does speed up as you get older doesn't it?!!!) - have a good one and wrap up warm if you're venturing out tonight! Enjoy time with family & friends and I will be back sometime next week or possible in the new year when I will try to get back to some sort of routine. 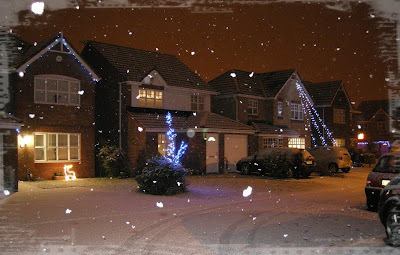 Thank you for all your visits, comments and friendship . . here's to a happy & creative 2010. photo of our house taken by hubby (23/12) during our 1 and only snowfall - lucky he did, as no trace of it now! 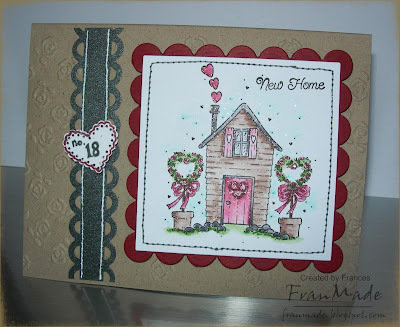 I've done a step by step of how I've made these cards over on the WoJ Inspirations & Tutorials blog so if you would like to see please pop over to here. Only 3 more sleeps to christmas. So if I don't see you before then, have a very merry christmas (filled with lots of crafting goodies ;)), enjoy time with your loved ones and here's to a happy & healthy 2010! Hellooo! Only 5 more sleeps till Christmas. Hope your christmas prep is all coming along nicely. Just 2 cards to show you today. 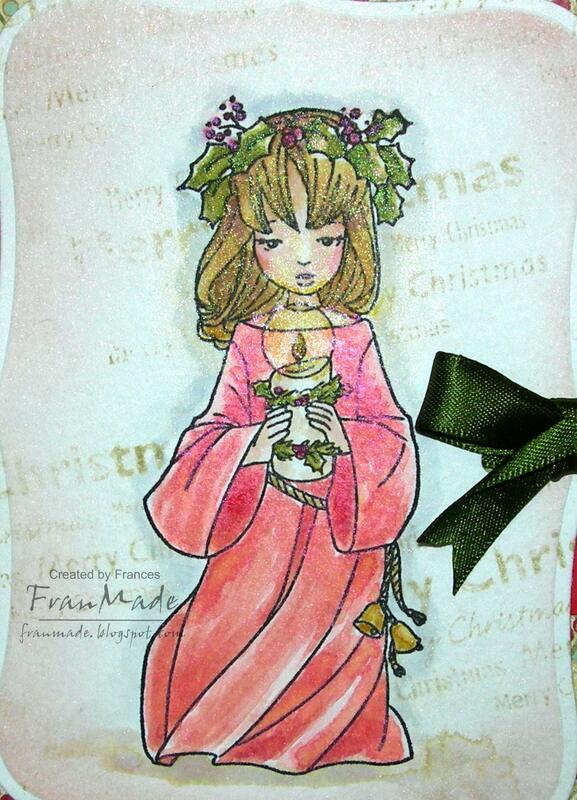 This one is christmas card for my big sis which I can show you now, as I know it's arrived in sunny Florida. These are High Hopes stamps and I just love the humour in them. 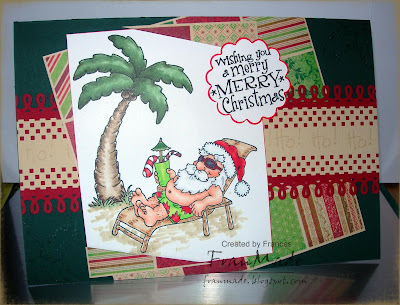 I've created a little scene/step card with this and have glittered/glossy accented the palm tree in the back :). Here's another shot of it so you can see how the card folds. 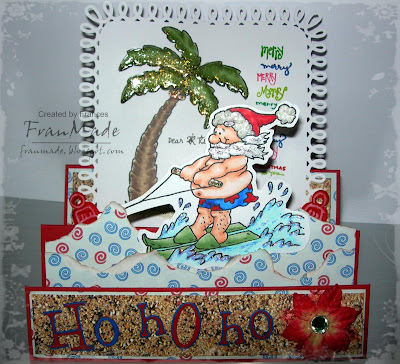 Water was just patterned paper ripped to create waves and Santa has 'white fluffy stuff' in his hat trim and stickles in his beard. 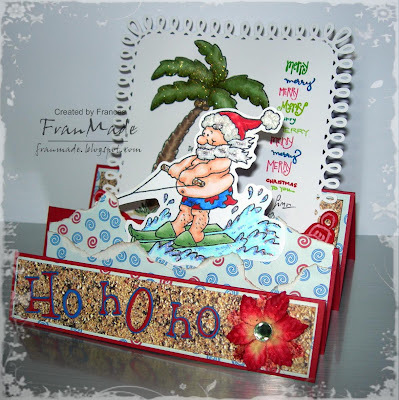 The 'ho, ho, ho' are cut from a Sizzix die. Not going to bother with stash list as it's all the usual suspects. Well that's all I have until mid week probably. Hope you're all wrapping up warm and enjoying the snow . . not a drop of it here in the north west :( so not fair! 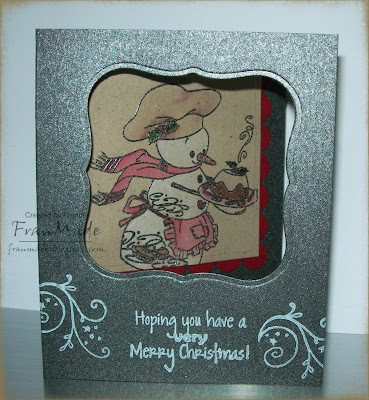 CCT this week wants to see apertures on your cards so I've done a very quick and simple one using some Nestibilities dies and a cute snowman from last year's WoJ christmas stamps (spent all of yesterday cleaning the house and also hit the dye bottle to hide all the white hair - not a good look when the rest is black!). Hardly any colouring needed on this. 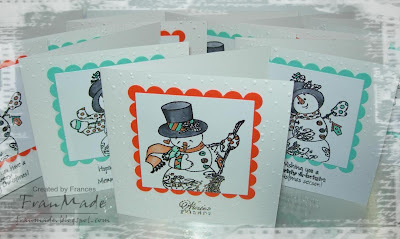 I embossed the snowman with a gunmetal grey powder then just gave him splash of colour by using Sakura stardust pens and waterbrushing it out (gives a very sparkly finish, more so than using twinkling H2Os). I did use a white H2O to colour him in. Others: white Elzybells inkpad for the white stamping (this is the best white inkpad I've tried - really white, as it should be! Really sorry for the lack of blogging and visits (I do still visit but just probably not leaving any comments/trace of my visit ;) ). Can't believe it's only 1 wk till xmas eve, still got lots to do and my sister arrives from HK today, so I best get back to it. no cards, just a pile of . . I've managed to make 3 so far (it's all the same pattern/hook but the " lumpy" wool just made it turn out WAY bigger than I thought, not to mention a bit lopsided - think that one's going to my oldest/biggest nephew haha). 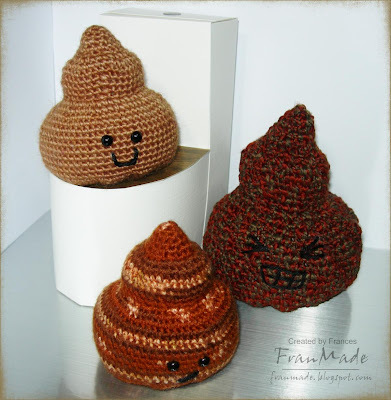 Still got 1 more to make and then the loo boxes to put them in but they won't take long plus that big one's just going to have to go in a brown paperbag as it's not going to fit inside the loo box! I am currently working on a few cards but that's going to be for the WoJ blog next week and then I've still got presents to wrap, cards to write and house to clean/tidy . . then I've got my sister over for the xmas hols so I really think you'll only get the odd post from me until the new year now. So until next time (probably my CCT card Thurs), have a good evening and I hope all your christmas plans/jobs are coming along nicely. Hello! sorry for the lack of blogging/visits this week but just not been in the mood and also been trying to sort out christmas presents etc (there is one I've made but can't show yet as it's winging it's way over to my sis in U.S and she reads my blog). 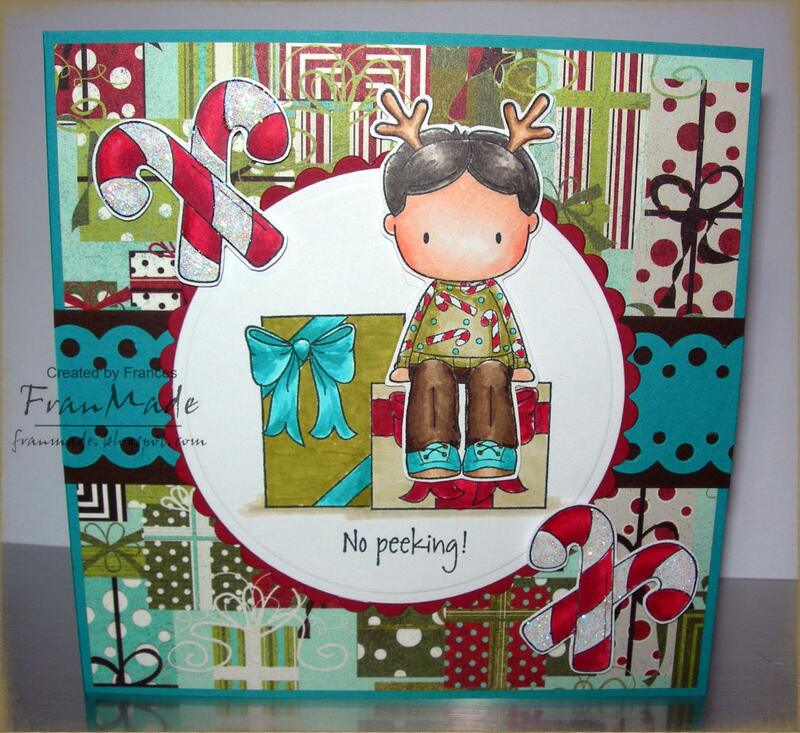 Anyway did manage to make this one for this week's CCT challenge. 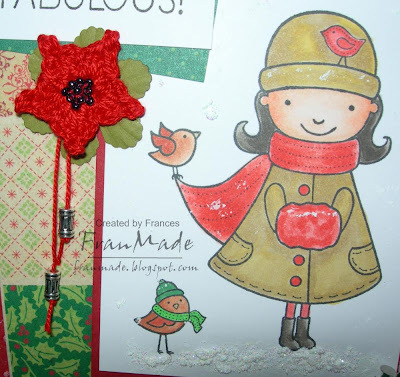 The theme being to use beads somewhere on your card. So for mine I've crocheted a quick little flower and added some seed beads to the centre and a couple of metallic silver beads dangling down. 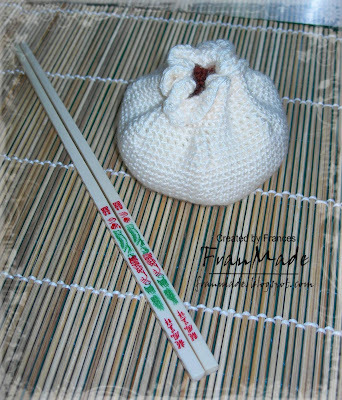 Tools: 2.5mm crochet hook & needle for making the crochet flower and sewing the beads in the centre. Nellie snellen flower punch for the green flower behind it. MS snowflake punches. 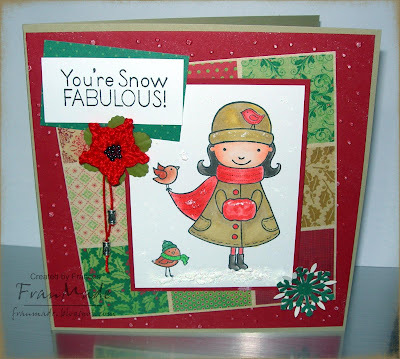 Oh, nearly forgot - used a cuttlebug snowflakes embossing folder on the red piece of card too then swiped bit of white ink over it. Hope you like it as that's probably all I've got to show for now. Off out to the shops today to try and finish the remainder of the present buying plus I need some new clothes - not been clothes shopping for ages (keep spending it on crafty stuff instead!). Wish me luck! Just another quick christmas card for the weekend. I'm afraid there might be a few more posts like this, now that time has pretty much ran out and these should be winging their way overseas asap. This one will be heading to Australia. Both tree and santa are High Hopes stamps. Not much else to say really, apart from it being a large card (A4 folded in half). Hope your christmas preparations are more advanced than mine! 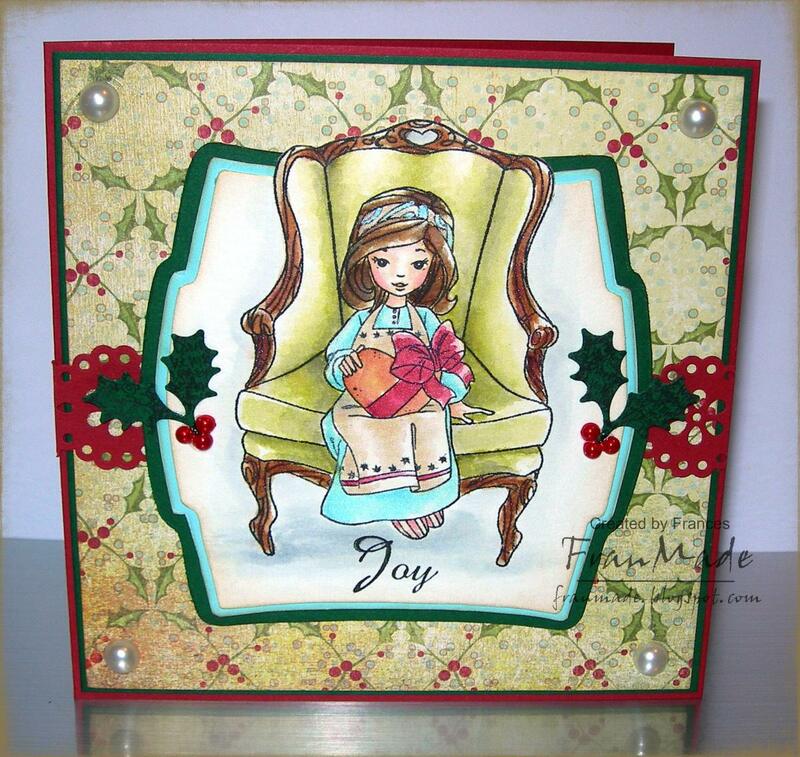 CCT wants to see girly cards this week. 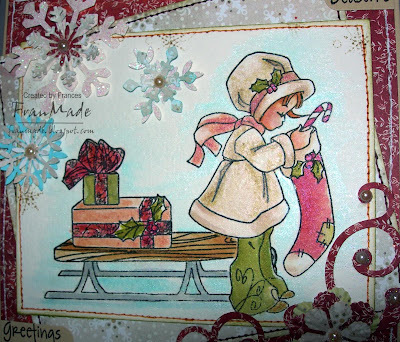 So I've gone for soft girly shades to make this christmas card using this girly Willow stamp and created a little scene with her by adding the sledge with presents by masking and stamping. 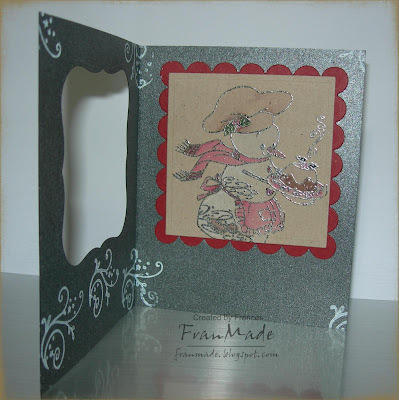 Lots of shimmer, snowflakes, flowers & pearls and couple of swirls too, just to make it extra girly. 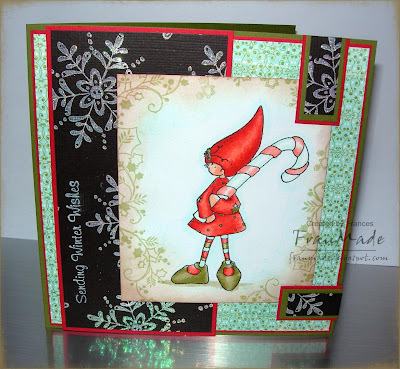 Just a quick post today with another cute christmas gnome from WoJ. and for all you WoJ fans Katharina is doing her annual advent candy over on her blog (see banner at top of my sidebar) with a daily candy draw to win the stamp shown on that day. Not much to say about my card except I've gone back to my copics for this one and used up the scraps of the snowflake background paper I made the other week. Thanks for dropping by and stay warm - it's gone really cold here. Well, it is December. Best go sort out some more presents. yup, I'm back again and we're back to the christmas cards. This is another WoJ image I coloured over the weekend and I have just quickly put it together now. Oh and I forgot to mention that there's a whopping 20% off all winter/xmas stamps at the moment, so go grab yourself a bargain. That's all for today and probably tomorrow too. Thanks for dropping by. It's release day over at Kraftin Kimmie's and as well as the funky images by Annie which I adore (you have to see Josephine with her lotion potion no.9 - it's hilarious and my favourite) there are 2 super sweet images by new artist Jean Grant. All available here. 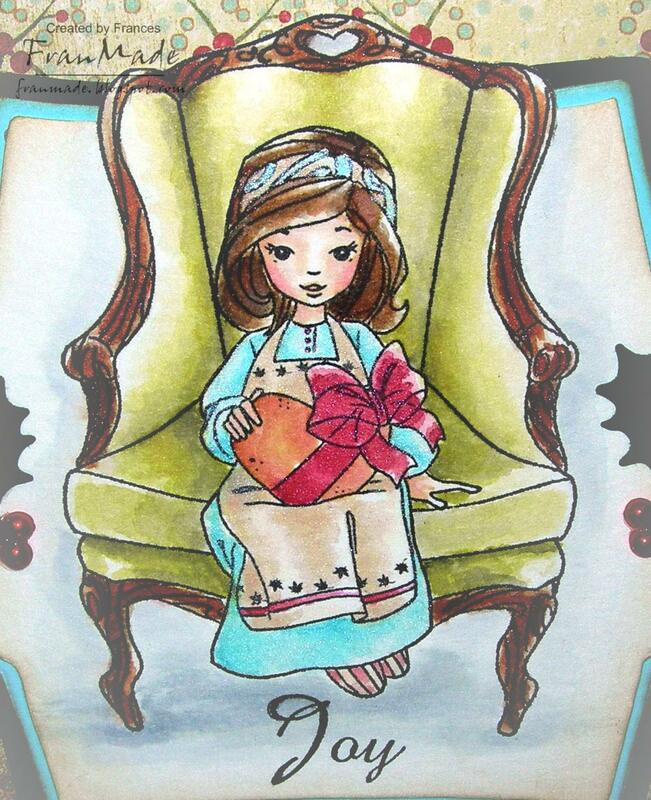 I've used 'Daddy's little girl' for my card today. They remind me of the picture illustrations in old children's books I used to read as a kid (anyone remember Mrs Pepperpot LOL, Milly Molly Mandy, secret seven, Enid Blyton . . . etc I loved my books!). So I've gone for a more vintagey feel and watercoloured with distress inks for a softer look (plus they were still sitting on my desk from my last card :)). Should have another WoJ card to show you later tonight, just need to decide on layout and try and get a decent photo - it's soooo dark and cold today - definitely day to veg in and craft. bye for now. Bit behind on the christmas cards so coloured a few WoJ images up at the same time (which I don't usually do) and gave my distress inks & twinkling H2O's an airing for a change. This is the first of them. Thought this Willow would look cute teamed with the armchair so stamped and masked her and added the chair. As I've watercoloured with combination of distress inks and H2O's it is lovely and shimmery IRL not sure if you can just about pick up a bit of it in the photo below. Not much else to say about this really as I kept the rest of the card very simple to leave the focus on the sweet image. 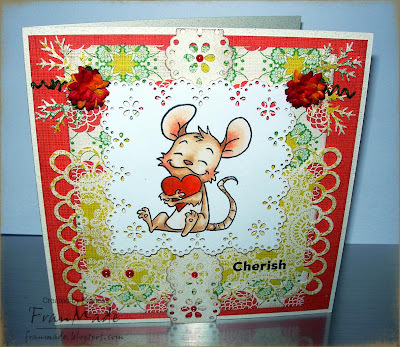 Should have another card or 2 to show tomorrow too (one should be a new Kraftin Kimmie release if I can finish it in time!). So hopefully see you then. Have a lovely Saturday. I'm starting to feel a bit more christmassy now that we've gone and bought a new tree (took the plunge and got a non-green one for first time ever ! . . it's a lovely champagne colour). Just need to sort out the presents and everything else now! CCT theme this week is to make card for a younger boy. 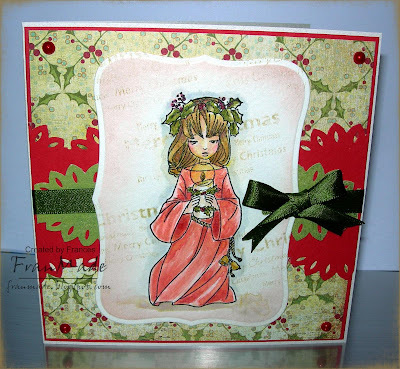 As always, CCT have fab sponsored prizes (this week it's some cute, new, 'Pink cat' stamps from Silly Monkey) so be sure go have a look and check out the other fab DT cards once you've finished here. 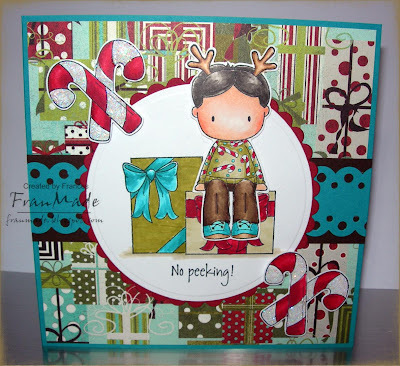 So, I thought I could use one of my cute CC Designs stamps I've been itching to use but not got round to, for this one. Isn't he adorable. I love his patterned sweater and the candy cane accessories are fab. I got him as part of their winter kit about a month ago ( and then they don't release them individually until a bit later, bit like Magnolia kits. Think these are due for Dec release if you're looking for them and your usual CC Designs stockists should have them). Can't tell from the photo but he is cut out and stuck ontop of the present stack with foam pads as are the candy canes. Then it's just a piece of Basic Grey DP and contrasting border strip running across and job done! didn't need anything else as the paper's so busy anyway. 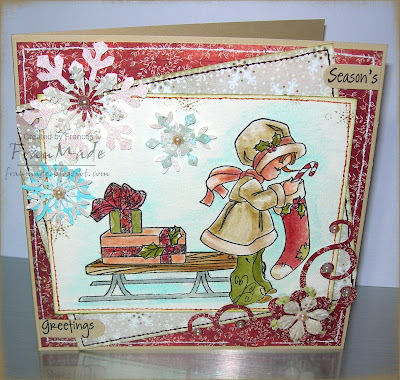 Paper: Basic Grey - can't remember the name one of the xmas ranges from last year or before. Thanks for looking and all the comments are always appreciated.